Before we tell you more about car hire in Uganda, it is important to note that driving in Uganda is on the left hand side as it is in the United Kingdom. Before you go on a Uganda safari or holiday, it is important to know which type of vehicle you will be using especially since not all roads are paved. AA safaris and tours offers a fleet of Saloon cars of different types, 4X4 land cruisers in different sizes including customized land cruisers of different types, custom-built safari mini vans, executive mini vans and coaster buses. Our fleet of vehicles is third party insured with full Comprehensive Insurance coverage and this only applies if it is our chauffeur is driving them. Our Uganda car hire prices exclude fuel. Our drivers are a complimentary however, if they are to have overnights in the national parks or places away from Kampala then you have to pay for their accommodation. Our saloon cars include, Toyota Corolla, Toyota Corona, and toyota premo, Mercedes Benz-es of different classes, RAV 4, and many others of different types. Self drive is only available with saloon cars and this is subject to tests before the vehicle is given to you. We usually do the tests to ensure that our vehicles are in safe hands. Terms and conditions of vehicle hire apply. Saloon car hire rates/prices range from US$ 50 to $100 per day. Our 4X4 land cruisers are comfortable. We have 7 seater land cruisers at US$ 300 per day while our ordinary land cruiser costs US$ 150 per day on free mileage basis excluding fuel. Self-Drive Full Comprehensive Insurance for Land cruisers only applies for those with a valid International driving License, 23 years old and holding a valid Full driving license for a period of more than 5 years. Our 5-door Safari-built land cruisers seat 5-7 people. They consume 4200 cc Diesel engine, hi or Low ratio 4WD. They have long range tanks, with pop up roofs customized for game watching on a Uganda safari Unfortunately, the safari land cruisers are not available for hire on self-driver they always come with a chauffeur. These costs USD 300 per day with a driver but without fuel. 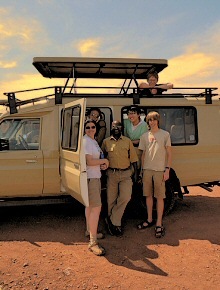 AA safaris and tours offer 4×4 minibuses of different types for hire and they must strictly be driven by our chauffeurs. differential lock. It costs US$ 150 per day . We also have an ordinary Minibus which seats 11 but it is not customized for safari because it has no pop up roof. It costs US$ 130 per day . .
Our Toyota Super customs seat a maximum of 7 people. They have3-Doors, a sliding roof, Diesel/Petrol Engine. They cost US$ 130 per day. For the 4WD vehicles, we hire them out with our drivers/guides unless we verify that you have ever driven in Uganda. The right to accept is ours. Please request for our terms and conditions for vehicle hire before you proceed to book vehicle . The rates apply only to Uganda and we offer special discounts to people who hire our vehicles for more than 10 days . For Special long term rates, please contact us to discuss your requirements. A copy of your passport, driving license, full contact details, referees and a full advance payment for the period of hire will be required before or on collection of vehicle. An additional cash deposit may be required under certain special circumstances. Drivers/ hire a driver in Uganda. AA safaris and tours will provide you with well trained drivers with driving licenses are obtainable at our company to assist you during your Uganda safari. They have experience in the local driving environment and your safety is unquestionably taken as their main concern. Most of our guides are English speaking guides in addition to being experienced in the tourism knowledge. These guides have traveled to all tourism sites in Uganda therefore they are more informed about the various places to visit in town, including the government offices, food centers, Non governmental organizations, hotels, discotheques etc. In case you are a visiting business guest, they will make your work simplified. Saloon cars, 25 seats Toyota Coaster Bus, 4×4 safari vehicles, RAV 4, Minibuses with roof hatch and 4×4 Land cruisers. We have safari vehicles with roof hatches which will make your game viewing spectacular in that you may yarn to go for more and more drives because of the fun and excitement which will make provide you with chance to come up with the most excellent shots of during your expedition. Each one of our vehicles is usually checked thoroughly, well maintained and are covered with full insurance. We caution you to prepare your personal medivac.